UCOG Today [Paul Kieffer] » Blog Archive » "My foot just fell on him"
"My foot just fell on him"
Today’s American football game between the Detroit Lions and the Green Bay Packers reminded me of my daughter Rachel 25 years ago. I made it to the USA this week in time to be here for today’s traditional Thanksgiving day NFL game. 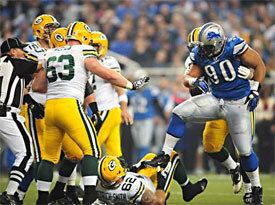 The Detroit Lions played the Green Bay Packers at home. In the 3rd quarter of the game, Lions 300 pound defensive end Ndamukong Suh was kicked out of the game for stomping on the arm of Green Bay Packers offensive lineman Evan Dietrich-Smith. The two had been engaged in a block on the previous play in which the Packers’ lineman had taken Suh to the ground cleanly. When Suh got up, he drove Dietrich-Smith’s helmet into the turf and then stomped on his right arm while he lay on the ground defenseless. Suh later said he was just trying to get his balance. His response was similar to my daughter Rachel at the age of 6 during a friendly wrestling match with her brother Ted, who was 9 years old at the time. Ted came into our room with a deep bluish bruise on his stomach, with Rachel’s mouth outline visible in the shape of the bruise. When we first asked her what happened, she said that she had her mouth open while they were wrestling and it just happened to close on Ted’s stomach during the wrestling match. With a little prompting, she later admitted that she had bitten him. Maybe Ndamukong Suh should have tried a 6 year old’s excuse: "My foot just fell on him."